The CCF Wolfpack Fun(d)raiser on Saturday 14th of May - what you need to know! Come and support our team that is travelling to Madrid, Spain, to compete at the Meridian Regionals! Open for any 6 athlete team that wants to try out a modified version of one of the Regional WOD's! FEE: R200 CASH ONLY (all money goes to the team, and if you beat the CCF Wolfpack you get your money back and all their team members must do 100 Burpees each!). YOUR TEAM: Must consist of 3 male and 3 female athletes. No minimum requirement per athlete though. ENTRY FEE: R50 CASH ONLY at the door for everybody. 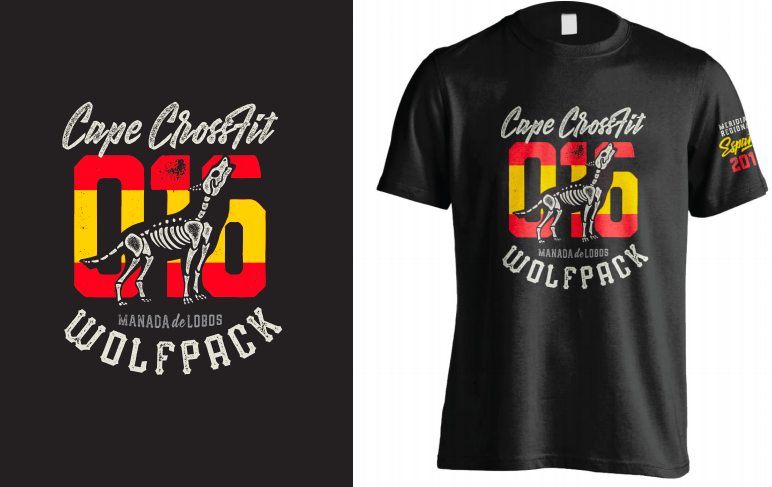 We are selling the CCF Wolfpack T-shirts (pictured above) as Raffle Tickets, and they obviously make for pretty cool supporter tees as well! The profit goes straight to the Wolfpack's travel costs and the prizes in the raffle are pretty damn cool so we hope to make the decision to get a t-shirt a no brainer! PRIZES: We will announce all the Prizes individually on our Facebook Event Page (FACEBOOK EVENT), but here are some epic examples: - 3 months of FREE Training at Cape CrossFit - R2500 voucher at the Reebok Store (valid after reopening in July 2016) - 2x Reebok Nano 5 voucher (valid after reopening in July 2016) - R1500 Push Fitness Apparel MALE Voucher - R1500 Push Fitness Apparel FEMALE Voucher - CCF Clothing Package: T-shirt, Long Sleeve T-shirt, Hoodie. - 2x 1 Night Bed and Breakfast stay at 4-star The Strand Hotel in Cape Town - Sports Massage & Recovery Package with our in-house Bio Jeanine van der Merwe (5 sports massage/lyno therapy sessions and 5 Compex Recovery Sessions) - PT Sessions with all Wolfpack members, 1 hour training focused on their individual speciality. - AND MORE to be disclosed! 12-ish and onwards "Braai Time"! We will light up the braai so bring food and cold drinks and hang out for a while. Why not have a beer while watching the Wolfpack do their second session of the day haha.. ;) So, what are you waiting for? Our friends from other boxes are planning to join in as well so book off your Saturday morning and come and hang with some of the most epic human beings Cape Town has to offer! You get to workout, stand a chance to win some epic prizes and all in all just have some fun in the name of fitness, we couldn't think of a better way to start a weekend..